Over at Pete George's place I've compared the Labour Party to a certain Roman god. 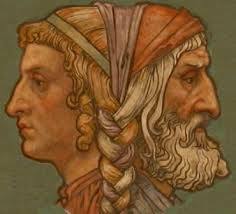 Also Janus was the god the Romans used in their houses at the door post. Ted Jenner can correct me, I recall it from my own study of Latin (four years) at school. And it is the basis of January as that month is the beginning of the year and we look forward and back. I'm conflicted re Ardern also. I still don't trust Labour. And indeed they have a somewhat Xenophobic policy (they deny it). The important thing is to enforce some radical policies around housing and rental and also leasing. Hence they need to freeze any investment or profiteering around real estate. The Government needs to intervene directly in that for private housing especially. The tax loopholes etc crackdown sounds good. The trouble is, who to trust? Ardern is clever. Her smile is a bit like that of a shark though. And now worrying events in Tonga Richard! Ted's coming to Pah Homestead tomorrow if you want to catch up. I might be able to. When and what time? Is there a new Prime Minister or something? I missed most of the news. Ted can fill me in later of course. ini bukan rekayasa dan yang saya tulis ini tidak ada unsur unsur kebohongan dari saya. Olá. Reconheço a importância de sua publicação, contudo, ressalto que disponibilizo publicações semelhantes com o teu website. Desta maneira, gostaria de compartilhar com vocês. friv jogos. Grande Abraço.